Career-I am a full-time Scientist working at Kimberly-Clark Corporation. I am a Mom of 3 and a proud one at that. Once I start talking about my husband and my kids and I can’t stop! Autumn is 7, Cody is 5 and Easton is 2 – my life revolves around them and as they are defining their interests and hobbies I’m finding that they are becoming my interests, hobbies and adventures. The minivan is a regular taxi shuffling kids to flag football, taekwondo, soccer, girl scouts, guitar lessons or swimming. I love nothing more than watching them grow and try not to miss any of their activities! 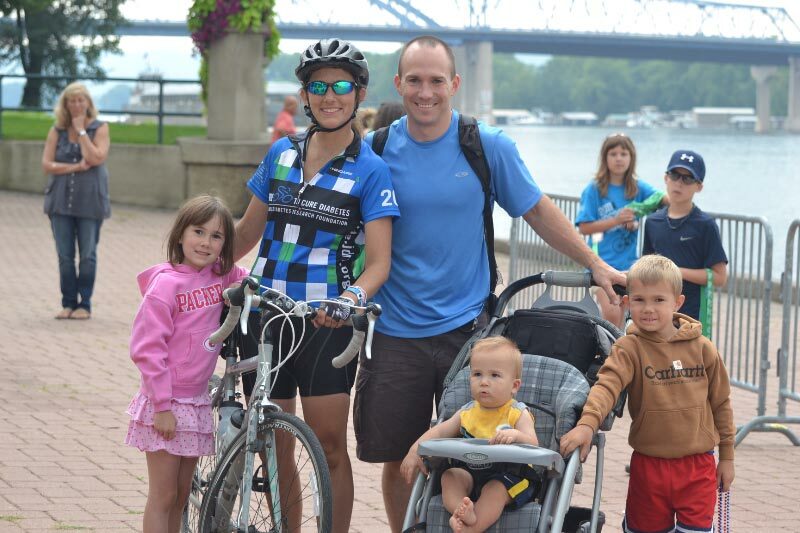 I started biking in May 2011 just 7 months after my son was born. Prior to road biking the most I had pedaled was when I attended UW-Madison and found a bike a very convenient means to get around campus. I was very fond of the “red bike program” and excited when I had a chance to ride one! I don’t remember details about the program but a local bike shop repaired donated bikes and painted them red. They were left out on the streets and if you were lucky enough to find one you could ride it to your destination. Once there you left it for another lucky pedestrian to ride! I always thought it was a neat idea and great way to encourage bike riding. I have been very happy with my Trek Lexa S (Women’s Specific Design) road bike. Not knowing if I’d enjoy riding I started with this nice entry-level model; however, after just a year of riding I’d like to upgrade to a lighter model with a Triple Crank (3 front chain-rings for a wider gear range) and improved shifter! I owe my friend Amber a big thank you for introducing me to the world of road biking. It was actually a journey we embarked on together! 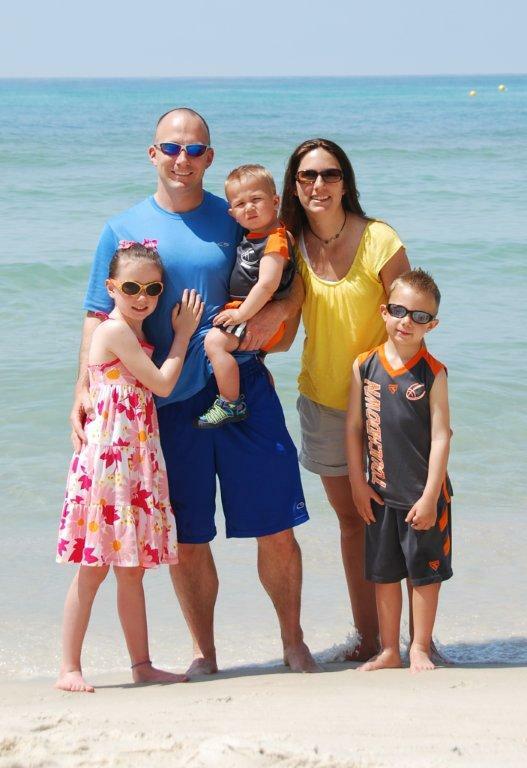 Amber’s daughter was diagnosed with Type 1 diabetes when she was just 2 years old. To show my support I have been making donations or participating in the Juvenile Diabetes Research Foundation (JDRF) Walk to Cure. After years of organizing a walk team Amber was looking for another way to support Christy and also take on a new personal challenge. 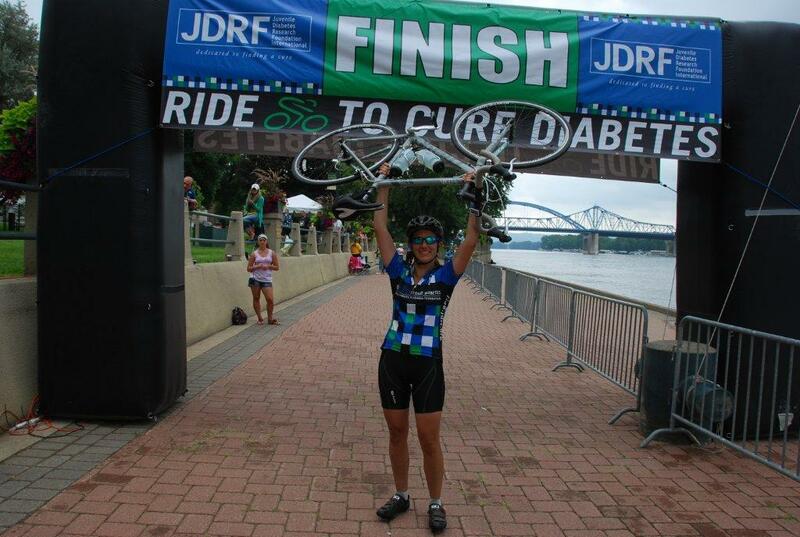 The JDRF Ride to Cure seemed like the perfect event! Riders register to participate in a 100-mile bike ride and embark on a training plan and fundraising mission. Rides are offered all across the country but Amber asked me to join her on the LaCrosse, WI 100-mile ride. After researching on the internet my response was, “these people are wearing spandex” and couldn’t believe I was entertaining the idea. Feeling out of my league but also up for an opportunity to support JDRF and challenge myself to return to my pre-baby weight I agreed. In just 4 months I had put in over 1000 training miles and crossed the finish line with Amber and my Northeast Wisconsin JDRF team in LaCrosse. I never imagined the pride I would feel in what has become my personal best – not everyone can say they’ve completed a century ride! The ride was very emotional and strengthen by love for road biking and support for JDRF! Without a doubt I planned on doing a JDRF ride in 2012. However, imagine my surprise when Amber starting toying with the notion of heading to Death Valley, CA for a JDRF century ride! It didn’t take much convincing and soon we had over 15 riders from the Northeast Wisconsin Chapter committing to this challenging ride! I am honored to be riding with such an amazing team and riding next to teammates that either have diabetes themselves or have children with the disease is inspiring. If they can overcome the daily challenges diabetes brings than I can certainly take on a higher fundraising goal and biking challenge. The ride is October 20th and with unpredictable weather and desert terrain it will be different from anything I have ever experienced. I’m most nervous about Jubilee Pass – a 7 mile climb! However, I am following my training plan and being pushed by my team to ride stronger and faster. I am building my confidence and I’ll be ready to face the Juvenile Diabetes Ride to Cure, 100 miles in one day in Death Valley, CA! How much more money do you need to raise? My JDRF fundraising goal for the 2012 Death Valley, CA ride is $4000. Honestly, I’m not good at fundraising and have a very hard time asking my family and friends for money but raising this much has me more nervous than the ride itself! To date I’m thrilled to say that everyone has been very generous and I am more than half way to my goal. The donations are inspiring too and have helped push my training to the next level. I don’t want to disappoint anyone that has donated to JDRF on my behalf! When I send my thank you notes after the ride I want to make sure they contain pictures of me standing at the top of Jubilee Pass and at the Finish Line! Any city/or Country that you dream of riding your bike through? I can’t say, yet, that there is a particular destination I’d like to bike through. As I’ve just started there are so many places and opportunities! However, I am curious to learn more about and ride in cities that have programs that support and encourage biking because I feel Wisconsin can do a better job in this area. For example, the sight of spandex seems to cause road rage and results in drivers passing unsafely and even obnoxiously honking horns! As a driver on the same roads I do understand how annoying it is to have to slow down for bikers and wait to pass but with the way our roads are designed the space has to be shared. Constructing road ways with bike lanes and large shoulders will only help to encourage biking and facilitate safer environments. We also need to focus on teaching bike laws as part of drivers education and remind bikers themselves to follow the laws. To me cyclelogical simply means riding for something you truly believe in. I AM cyclelogical because I believe that with every mile I pedal we are closer to finding a cure for Juvenile diabetes. I AM cyclelogical because I believe that riding not only keeps me in shape but encourages me to make healthier choices. I AM cyclelogical because I believe that it’s more fun, better for my family and better for the environment to ride to the park instead of driving. It’s important to be cyclelogical or your bike will sit quietly collecting dust in the corner of your garage. Preparing for a long endurance ride requires an athlete to spend a lot of time in the saddle. Spending this time away from my kids and putting pressure on my husband to be Mr. Mom on ride nights makes me feel guilty. This guilt can easily convince me to stay home and skip rides. However, I have seen road biking make such a difference in my life. I’m healthier and back to my pre-pregnancy weight, I’m making healthier choices and enjoy a salad at lunch versus a cheeseburger and fries. My kids are even proud of me when I ride and are learning valuable lessons themselves in eating right an exercising. This summer my daughter Autumn asked several times to bike ride instead of driving to summer camp. My motto has become “lose the guilt”! I may miss a kid activity or not be home to make dinner but by taking care of myself I’m doing something that makes my entire family better! Since cycling has made such a big impact in my life I would like to thank everyone who has supported me! My family and friends have been amazing through their donations and checking-up on my training. My Northeast Wisconsin JDRF ride team, coach and Amber have inspired me to train one notch higher and have taught me everything I know about the sport today. The Northeast Wisconsin JDRF Chapter coordinators have done a fantastic job keeping us all connected, organizing the ride and monitoring our fundraising progress. My husband undoubtedly gets the most credit though! He believed in me before I believed in myself. He happily takes our kids for hours so I can ride guilt-free and doesn’t hesitate to show me just how proud he is! Thank you everyone – from the bottom of my heart! Categories: bicycle, bike, Cyclelogical, cycling, Events, Inspiration | Tags: 100 mile charity ride, bicycle, charity rides, cycling, Death Valley, inspiring, JDRF, Juvenile Diabetes, LaCrosse, lifestyle, road bike, Road Biking, Wisconsin cycling | Permalink. We know there are lots more out there so feel free to share with us via our comments link at bottom of post, with what ride or race you are training for! Ragbrai– an annual 7 day ride across the state of Iowa. We have exhibited here in the past few years on the first day. This ride sounds like a blast! Door County Century Ride– Located in Door County Wisconsin, this ride sounds like fun and filled with stunning scenery. TD 5 Boro Bike tour– We were in New York for the New Amsterdam Bike show last year during this tour. A great way to see the Big Apple. 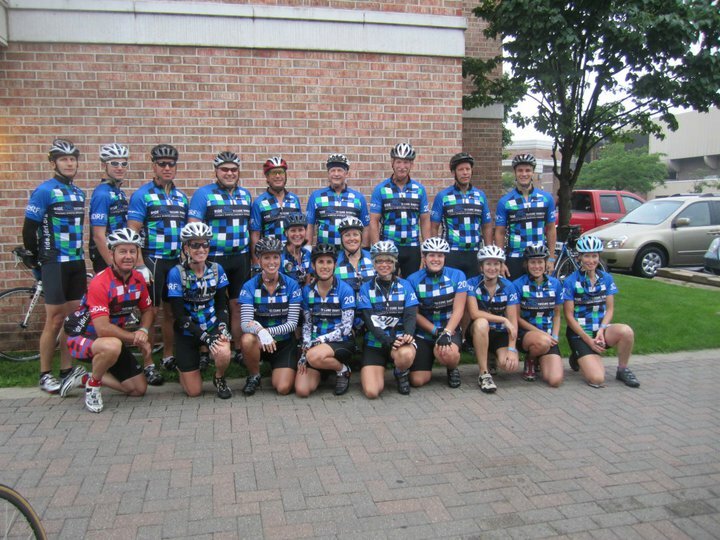 UPAF’s Ride For The Arts-I did this ride last year here in Milwaukee and enjoyed every minute. Its a great ride for families as well. You can do 5, 12, 25, 50 or 75 miles. RSVP-Ride from Seattle to Vancouver and Party– this ride is affiliated with the guys from the Seattle Cascade Bicycle Club. It sounds like a fun ride and to be able to see two of the best cities in North America…what could be better? Fruita Fat Tire Festival- A week long eventl that ends with an 18 hour race. Sponsored by New Belgium Beer. The two always go hand in hand-beer and bicycles. Subaru Elephant Rock Century Ride– Another multi-mile ride for all types of cyclists. this ride is located in Colorado as well and they are celebrating their 25th anniversary this year. We know there are lots more out there so feel free to share with us via our comments link what ride or race you are training for. Categories: bicycle, bike, Cyclelogical, Events, family, Inspiration | Tags: bicycle rides, bike events, bike tours, charity rides, cycling, mountain bike race, Road Biking | Permalink.